Boat weddings are very popular in Thailand and they are favored by adventure loving couples who wish to add a tinge of oceanic blues to their wedding dreams. 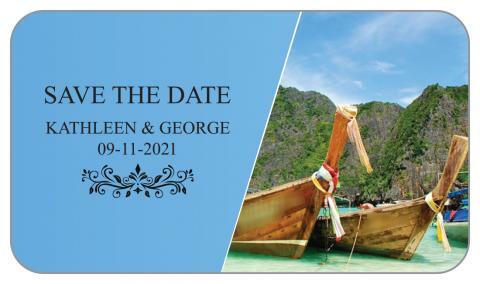 They can always go bohemian while expressing happiness and thrill about impending Thai boat wedding by seeking custom 3.5 x 2 inch traditional Thai boat wedding save the date magnet. Personalized 3.5 x 2 inch traditional Thai boat wedding save the date round corner magnets will gain easy acceptance in homes of friends and loved ones because it can transfix any surface with ease.